Growing tomatoes hydroponically means tomatoes grown in a solution without soil. Hydroponic tomatoes, when ripened on the vine, are superior tasting compared to tomatoes grown in the field. There are those who will tell you that hydroponic tomatoes lack flavor, however this is not true for the home gardener. Commercially grown hydroponic tomatoes are picked green and are not given the opportunity to develop flavor. They are picked early with a view to extending their shelf life and for ease of transport. The home hydroponic gardener doesn’t have these concerns and can let their hydroponic tomatoes ripen on the vine and develop their full flavour. Hydroponic culture is one of the most exacting and intensive methods of crop production used in agriculture today. A hydroponic growing system is an intensive form of agriculture that can fulfill consumer demand for premium produce while providing the grower with a profitable business. The hydroponic growing system is a technology for growing plants in nutrient solutions (water and fertilizers) with or without the use of artificial medium (e.g. hydroponic systems are further categorized as open or non-recovery where, after the nutrient solution has been delivered to the plant roots, it is not reused; or closed or recovery systems where surplus solution is recovered, replenished, and recycled. Hydroponic tomatoes, ripened on the vine, are superior in taste compared to field tomatoes. Hydroponics is a fairly complicated process of growing high quality tomatoes throughout the year in a soilless, controlled environment. By eliminating the soil, you eliminate soil borne disease and weeds and gain precise control over the plant’s nutritional diet. In a hydroponic solution, you provide the exact nutrients your plants need in precisely the correct ratios so they can mature faster and develop stress-free which will ensure that at harvest they are of the highest possible quality. The idea of soilless gardening or hydroponics has been around for thousands of years. The Hanging Gardens of Babylon and The Floating Gardens of China are two early examples. Scientists began experimenting with soilless gardening around 1950. Since then several countries, such as The Netherlands, Germany and Australia have used hydroponics for crop production with amazing results. Hydroponics has been proven to have several advantages over soil gardening. The growth rate of hydroponic tomatoes is 30-50 percent faster than a soil plant, grown under the same conditions and the yield is also greater. The nutrients in a hydroponic system are mixed with the water and sent directly to the root system so the tomato plant. Those nutrients are being delivered to the plant several times per day. A hydroponic tomato requires very little energy to find and break down food so the plant can use this saved energy to grow faster and to produce more fruit. Hydroponic tomatoes have fewer problems with bug infestations, and disease and are generally healthy plants. Hydroponic gardening uses considerably less water than soil gardening due to the reuse of the nutrient solution. Hydroponics generally require few if any pesticides. 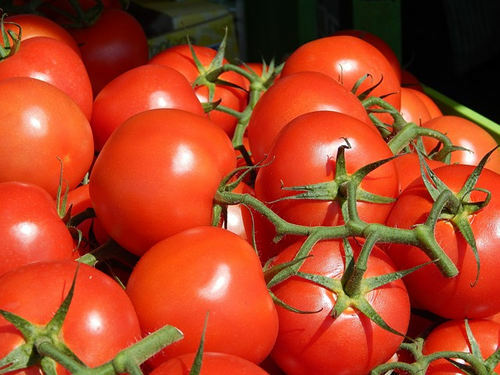 Tomatoes are the biggest hydroponically produced crop on a worldwide scale. Tomatoes will ripen and develop a bit more flavor if left at room temperature in indirect (not direct) sunlight for three to five days or when placed in a paper bag with an apple or banana for a day or two. Most who have tried them will agree that tomatoes grown hydroponically, indoors under lights, are equal to, or superior in flavor and nutrition than outdoor, soil grown tomatoes. Tomatoes are rich in the most powerful antioxidant of all the carotenoids, lycopene, which gives the fruit its red colour and is thought to be one of the key nutrients behind the Italians’ low rate of heart disease.